First of all, i would like to say Happy 48th National Day Singapore!!! Its great to be part of the celebration, but we couldn't get the tickets to the floating platform, looks like have to settle with the TV at home...again. My daughter can't wait to celebrate this event and she has actually volunteered to make the National Flag, i was quite surprised and this time without me suggesting in the first place. Looks like her child care center has taught her well. In fact the center started the celebration earlier and she told me that she had a great time and hence wanted to bring the same atmosphere to our home. Before i knew it, she had started to make the Singapore flag. Nothing too fanciful, but 100 marks for the effort! 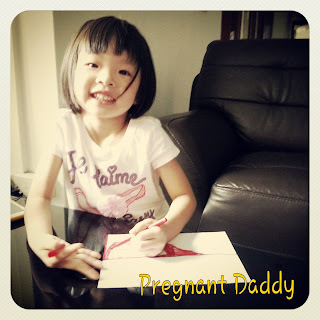 Why the name "Pregnant Daddy"? ?